Art often arrives in the wake of disaster as a swift response: an attempt to console quickly or to raise funds. Meaningful art often takes longer to arrive. In the immediate aftermath of trauma, the emotions run high and perspective is hard to achieve. I’m living in melancholy in the fog is the work of two friends, one who was in Japan at the time of the Fukushima disaster and one who was away in China. Together they have created a work of lonely beauty that sounds like loss and separation. It’s an important album in the same way as Anoice’s Black Rain is an important album, a distillation of a nation’s feelings through music, the inexpressible reflected through sound rather than through words. Masayoshi Miyazaki contributes the music: restrained, repeated melodies on the piano, guitar and sitar, a personal attempt to mull over, process and perhaps one day conquer feelings of despair and alienation. One cannot imagine what went through Miyazaki’s mind as the news reports came in: the earthquake, the tsunami, the meltdown, the casualties. Perhaps even more importantly, the lack of news: the details not shared, the names not read. One hears his music as dirge and tribute: I am not there. My heart is shattered. I am capable only of this. 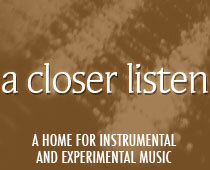 Hiroshi Kobayash contributes the field recordings, without which the album would be downcast, but less resonant. Military planes fly overhead: where are they going? No one is watching the machines. How bad is it? Children play, unaware. The water rises. A needle spins, unattended, caught at the end of a groove. Thunder cracks. Footsteps echo. Where is the Off switch? Is anyone alive out there? The Geiger needle jumps. The emergency vehicles move in. Debris is moved, wood shifts, but in response, only the tweeting of a single bird. And now, as the full scope is unveiled, the sound of water overwhelms all else: water flowing, dripping, lapping, still beautiful but no longer benign.